June 19, 2013, 2:57 PM · Let me get this straight: If I'm preparing an audition, I can play my excerpts for, and get pointers from, the assistant concertmaster of the Los Angeles Philharmonic Orchestra, without leaving my living room? Online violin lessons certainly have evolved, with new technology better enabling the one-on-one exchange needed for learning violin skills. And online teaching is attracting some big players, for example, LA Phil Assistant Concertmaster Nathan Cole, who at age 35 is among the youngest members of that orchestra (though older than its conductor Gustavo Dudamel, 32!). Last fall he joined the online music school ArtistWorks as its first classical violin instructor. "This is not primarily a substitute for face-to-face lessons, because that's going to have its own dynamic that you can never replicate," Nathan said of the online lessons. Of course, if someone is geographically isolated and has no access to a violin teacher, "in those cases, it is a substitute. It's that or nothing, for them. But everybody makes improvements. It's been really exciting." Here's how it works: you pay to join Nathan's Online Classical Violin School, and that gives you access to several hundred videos that Nathan already has made, including a staggering 69 videos about orchestral excerpts, which include his performances and lessons on each. Other videos are about etudes, repertoire and basic violin skills. Then, there are "video exchange" lessons, in which a student submits a video, then Nathan makes a video reply. Everyone's video exchanges are available to the whole studio, so you can watch other people's lessons, which may be relevant to the piece or lesson you are learning, or submit your own. Let's say you are working on one of the most common orchestral excerpts that is asked at auditions: the first page of "Don Juan," by Richard Strauss. "So, practically speaking, if someone's working on Don Juan, and they're a subscriber to my site at ArtistWorks, then they have my eight-minute lesson on Don Juan, they have my solo performance, my performance with a piano reduction, and the piano track by itself, if they want to play with that," Nathan said. "Then, of course, they can post their own video of themselves playing Don Juan, and I send them an exchange. But even before all that, they can look at the other students' exchanges, who've done Don Juan." This major teaching project grew from Nathan's desire to create online lessons about orchestral excerpts. Before he even knew about ArtistWorks, "I had put together a little series of videos on the Schumann Scherzo excerpt -- a performance, and then also breaking it down a little: how to practice it, that kind of thing," Nathan said. "I had the idea that I was going to do this for all the major excerpts. But by the time I finished the Schumann Scherzo, it was two weeks of my life, gone! I was glad I did it, but I thought, realistically, how many more of these can I do? So I put it aside." "Then I read an article in the LA Times about ArtistWorks and how people were learning various instruments -- jazz guitar, electric guitar, percussion -- with this online system," Nathan said. "Anybody could join, and they would studying with these great teachers -- names that I knew in the bluegrass and rock world. I thought, 'Hmmmmmm…'"
"So I went to this site and I looked at some of their sample lessons, and the quality was just stunning," Nathan said. "I thought, 'Who's paying for this? How do they have the multiple camera angles, the really great sound and everything else?' I decided I'd call them up and see if they'd thought about doing this with classical. They were way, way ahead of the game. I called just in time. They looked at what I'd done on my own and decided, if you're that enthusiastic about it, then we want you." As of now, he has about 60 students through ArtistWorks. Nathan grew up in Lexington, Kentucky, where he started at age four with Suzuki teacher Donna Wiehe of Lexington Talent Education Association. Both of his parents are musicians -- flutists, and "I guess there were a lot of musicians in our family," Nathan said. 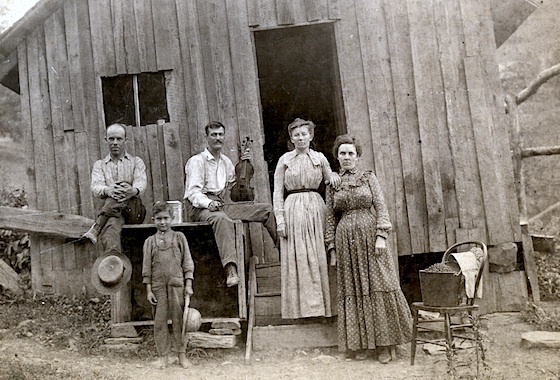 "We have a picture from the 1800's of maybe three generations, in front of the farmhouse, and my grandfather's grandfather is holding a violin. He was the town fiddler, I guess, in western Pennsylvania." Nathan's grandfather was a flutist in the Philadelphia Orchestra, and he taught both of Nathan's parents in college. When Nathan was a child, Lexington was brimming with Suzuki groups, as were many towns in the Midwest -- in places like Illinois, Wisconsin, Minnesota, Ohio and Kentucky, Nathan said. "Lexington had probably seven or eight major Suzuki studios, which is a lot for a town of only 150,000 people. My teacher had something like 80 students. There were really healthy group classes and seminars, and so it was natural to start on the violin." "I remember very clearly, some of the first group classes: when we had the Cracker Jack box with the ruler taped to it, and the cardboard part of the coat hanger," Nathan said. "I remember opening the Cracker Jack boxes, and getting the real violins. I really have only happy memories of that. I think it's awesome; I love the Suzuki method. As was typical in Suzuki at the time (and it's much less so now), he did not read music for the first four years. His parents took it upon themselves to teach him music reading, when he was eight. "But those four years of learning everything by ear, just imitating and repeating, were very valuable. There's a reason (Suzuki has) lasted this long and been so successful; that's how people learn." "I did book recitals probably for at least five of the books -- one of which is on Youtube!" Nathan said. That's his seven-year-old recital, with music from the first three books. He finished the Suzuki books by age 10 and moved on to his next teacher. It was around then -- when he was a teenager -- that he actually started teaching, as well: tutoring other kids on pieces he'd already played. And when was Nathan's first audition? "I'm thinking, youth orchestra," Nathan said. "Seating auditions." Those required preparing two pieces, to play for the conductor before the season started. "That just felt totally unfamiliar. You get this xeroxed page of music, and it has more sharps and flats than you're used to, and all these strange markings and maybe your teacher's never heard of this piece, or if they've heard of it, they don't want to deal with it!" His first major audition was during his fourth year at the Curtis Institute, when he auditioned for a spot in the Philadelphia Orchestra. "Even though it was just down the block, I really felt like I was stepping into unknown waters," Nathan said. "I did what I'd seen some other people do: prepare the excerpts, practice a lot, of course, and play some mock auditions." "Then stepping out onto that stage in that huge hall, alone, that was…the very opposite of comfortable," he said. Instead of asking for him to play his solo, they started straight in with the Don Juan excerpt. "I did advance to the semi-finals, but when those came, I realized how many holes there were in my preparation. They asked for the cadenza of the Brahms Concerto, and I had kind of treated that as an afterthought. It was prepared, but not prepared to go against the people who were going to win that audition. And I had some creative fingerings for a couple of the excerpts that, if they came off, were going to sound great, but if they didn't come off, they were going to sound amateurish. They didn't come off. Now that I've sat on the committee side of so many auditions, I can imagine, I would have been shaking my head behind that screen, thinking, 'What is this person doing?' There's no way I would have voted for that playing!" Since that time, he's played more than a dozen professional orchestra auditions and landed some dream-gigs: for example: the Chicago Symphony, St. Paul Chamber Orchestra and Los Angeles Philharmonic. What is key to winning an audition, big or small? "First is preparation, which sounds simple -- everybody wants to prepare, everybody tries to prepare," Nathan said. But after that Philadelphia experience, "I understood: I have to be ready to play every bar of every excerpt and all solo works, starting in the middle, wherever -- under uncomfortable conditions," Nathan said. "So I tried that out quite a bit." He also had received some key advice: "Show them who I am," Nathan said. "In other words, rather than trying to imagine myself playing in such a way that people would like me, just play the way I play. Do my homework, of course. But play the way I play, and expect that if that's what they're looking for, then I'll get the job. And I felt much freer." By now, Nathan has also sat on the jury for many auditions. What kinds of mistakes do people make? "To be frank, far too many people show up that really have no chance of winning the job," Nathan said. "I don't think it's helpful to go to an audition that you don't think you have a chance of winning. Not everybody agrees with that. But I think there are better ways to help your playing, better things to do with your time." For most violin auditions, only about a third of the people trying out wind up being seriously eligible candidates. "It's such an investment of time and usually money. To go into it with no chance -- that's tough. If you do very many of those, you won't want to audition any more, and that's unfortunate." How does a person know what orchestra is appropriate for them? One idea, he said, is to check with websites like myauditions.com, where people talk about who won which audition. You can also check on orchestra websites, to see who won recent auditions, then look at samples of their playing on Youtube. "Look at how they play, and if your first reaction is, 'Wow, that's way beyond where I am,' then why put yourself through an audition?" he said. "If your reaction is, 'Wow, they're really well-prepared, but I think I want to throw my hat in there,' then do it. If you're studying with a teacher, then ask your teacher's advise. But I think a lot of people either get no advise, or they believe that any audition is just going to be good experience." As for the actual playing: "Rushing is maybe the most common problem," Nathan said. "And I can tell, a lot of times, when that's due to nerves. But sometimes it's just due to bad habits. It's easy to get into the habit of rushing if there's nothing or nobody telling you that you shouldn't. And then, there is inconsistency of intonation. A good orchestra section has to be made up of people that have some kind of common reference, so you have to demonstrate that at the audition." In a nutshell: the most common problems are rhythm and pitch. Switching gears, what is it like to play first-desk in the LA Phil, literally right under the wildly popular and dynamic Gustavo Dudamel? "It's so great, and I get to sit close to him all the time," Nathan said. "Everybody knows about his energy and his passion, but it's also his commitment, his work ethic. It's not just random energy, it's really directed, really focused. There's no slacking off -- professionally I can't slack off, but also, I wouldn't want to: I'd be letting him down, letting my colleagues down. We're all there, focused on the task." "There's no off-podium persona for him," Nathan said of Dudamel. "I was just reading an article on Roger Ebert, who just passed away, and someone was making that point about him: that he really lived movies and art; he thought about those things all the time. And with Gustavo the same applies: this is what he does, this is what he loves. And what kind of instrument does Nathan play? "I'm lucky to play one of the orchestra's Stradivari, the 1729 'Jack Benny,'" Nathan said. "It's wonderful: I love playing it. The instrument that I own is a Vincenzo Postiglione from 1910. They're very different -- obviously one is affordable and the other isn't! But I've been lucky, this is the second Stradivari that I've gotten to borrow long-term. It's a real education -- about listening to the character of the sound rather than insisting on creating a sound from scratch all the time. There's so much ring that can build up in an instrument, if you let it. It's true for all instruments, but especially some Strads. As most people probably know, some Strads don't like to be pressed at all. Fortunately, the Jack Benny is very easy to play and it's agreeable to lots of different styles. But once I listen to the sound of the instrument, my playing is more interesting. And then that translates to when I play on something else, too." BELOW: Nathan Cole plays Enescu Sonata No. 3 for violin and piano, with pianist Alessio Bax July 8, 2012 at the Mimir Chamber Music Festival in Fort Worth, TX. June 21, 2013 at 02:26 AM · Interesting interview -- thanks for sharing. Loved the videos, too. For those who haven't done so yet, check out NC's Sibelius on his YouTube channel. Auditions were a strong suit of mine -- although, ironically, after winning the last two, I realized at length that I didn't want to go pro after all. But thank goodness for those who do. June 23, 2013 at 11:30 AM · I haven't used Nathan'service - a bit advanced for me. But when I asked a technical question on the forum he gave an extremely insightful reply. I suspect that training with Nathan would be very rewarding.